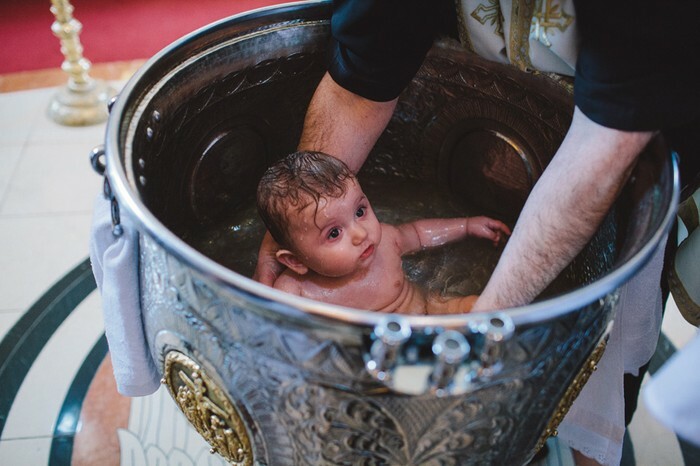 Birth and Infant Baptism in Christianity. -Performed by Orthodox, Roman Catholics, Anglican and Methodist Churches. -Child receiving God's grace and given the chance to live a new life, free from sin. -Opportunity for parents and godparents to express intention to bring up child in the Christian faith. -Priest then signs a cross on the child's forehead, 'I sign you with the cross of Christ'. -Congregation promises to support the child in the faith. -A lit candle is given to the parents as a symbol of the child passing from darkness into light. 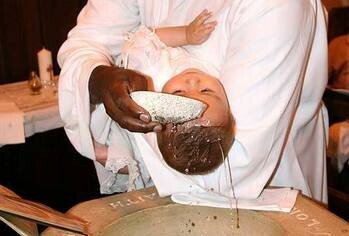 -Appropriate hymns, sermon (about the meaning of Baptism) and prayers are made for the child. -The ORTHODOX Church dips the child into the font three times, and this is followed by Chrismation, in which the child is anointed with oil as a symbol of the Holy Spirit. The child then receives it's first communion. -The BAPTIST Church and OTHERS have a service of Dedication to thank God for the child and dedicate the child to God. They believe baptism should take place when a person is older. SALVATION ARMY and QUAKERS do not baptise as they don't believe it is necessary to receive salvation or communicate with God.